This is American pianist Peter Orth’s second recording for Challenge Classics, following his 2014 label debut with Beethoven’s Diabelli Variations. There are also a number of distinguished discs of chamber music with the Auryn String Quartet. He was a prizewiner in the US and made a major career there in the 19080’s but has been based in Europe since 1992. He is the Professor of Piano and Chamber Music at the Hochschule for Music in Detmold, Germany. It is an interesting idea to pair Scriabin’s 24 Preludes, Op 11 with Rachmaninov’s Sonata No 1. These works, by Russian contemporaries, composer-pianists and friends, are really quite different in style – apart from the assumption of a high level of technical skill on the part of the performer. The Scriabin is early, the twenty-four items being written in various different places over several years (1888-96). Some of the pieces were written in his teens, while most date from 1895/96. They are organised exactly like Chopin’s great set of 24 Preludes, with the same key sequence moving around the circle of fifths. It is often said that they resemble Chopin in other ways, including technically, but still most of them sound like Scriabin, if not yet at his most characteristic. For Peter Orth it seems these pieces have been “a constant companion” since, as a schoolboy, he heard Gina Bachauer play them in Carnegie Hall and he has recorded them as an offering for the Scriabin centenary in 2015. They are a worthy contribution to that anniversary, which did not exactly flood the market with recordings of Op.11. Orth does indeed sound like he is very familiar with the work which he plays with affection and insight. He acknowledges the Chopin inheritance in such pieces as numbers 1 and 23, of course, but still makes us aware of Scriabin’s different harmonic domain, and the often febrile, questing nature of the music. Number 8 is a good touchstone – that’s the one with a fast metronome marking that Rachmaninov ignored when he played it, leading to a dispute with the composer– “it’s my interpretation” said Sergei; “it’s my music” said Alexander. Piers Lane on Hyperion takes 1:09 which respects that metronome mark, while Mikhail Pletnev on Virgin takes 2:25 and does not. Like Rachmaninov’s recording (2:34) Pletnev’s tempo makes the piece more nostalgic, less impetuous. Peter Orth steers a middle course with his timing of 1:45 seeking the best of both worlds, but perhaps getting more of the nostalgia than the impetuosity. Scriabin would have preferred Lane perhaps – at least over Rachmaninov, whose version is very affecting, but makes it sound like Rachmaninov. 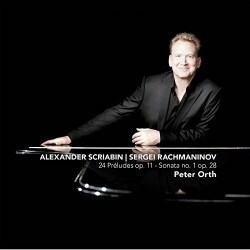 The other item on Orth’s disc is authentic Rachmaninov, in the form of the wonderful Sonata No.1, a mature work from the period of the Second Symphony. This has long been neglected in recitals but has enjoyed several impressive recent recordings, and Orth’s is another such. His is an individual view, especially of the opening of the work. Where others favour a dramatic call to arms, Orth insinuates his way into the long first movement, with an intimate approach, downplaying dynamic contrast and softening dramatic outlines. It is an ingratiating entrance, with a rapt delivery of the lovely B flat melody when that arrives. The drama gathers as the movement progresses, and Orth’s breadth (his15:34 timing for this movement is a little more than most), adds a certain weightiness which suits the work’s subtext – it’s essentially a “Faust Sonata” and homage to Liszt’s Faust Symphony. The slow movement is searchingly lyrical, and the finale drives along compellingly and packs the required climactic punches when required. In summary a well-filled disc of two major but hardly well known works of the Russian piano literature, in what I think is a unique coupling. If you don’t know either, Peter Orth will be a valuable guide to theses contrasted masterworks. There is very good sound and a booklet note which has the relevant background to each composer and his opus, but is a bit skimpy on the actual music. For the seeker after the best version of each work, however coupled, there are alternatives to investigate, such as the Scriabin from Lane and Pletnev mentioned above, and Nikolai Lugansky and Leslie Howard in the Rachmaninov, both of whom add the composer’s Sonata No. 2.